Frozen seems to be the big thing for Halloween this year. Lets see a raise of hands if you know someone going as a character from the movie. Although I love the Movie Frozen, I was more inspired by the show Once Upon A Time for this mask. 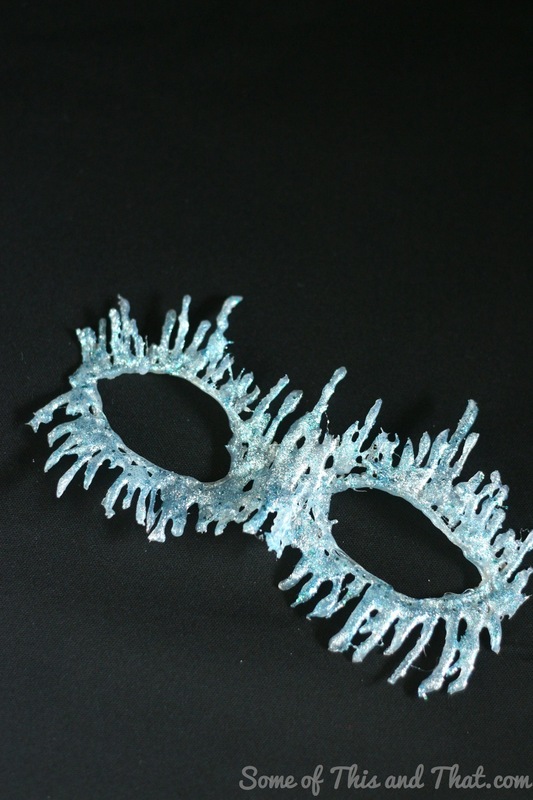 I love anything sparkly and blue, and this mask was so easy, you probably have everything you need to make it on hand to make this DIY Ice Queen Mask. The girl, who is anti girly, could not wait to make her own mask, and the great thing about these is that you can totally customize them to match your costume! Change the shape, color and decorations and make a cat mask or even a TMNT mask! As always, if you decide to try out any of our Halloween How – To’s be sure to post and tag us on Instagram, Facebook and Twitter! We love seeing your projects! If you are not already, be sure to subscribe to our YouTube channel! We do things there that are not always posted on the blog! Previous Post: « DIY Galaxy Bag! Doctor Who Tardis Bag! Very cool! Stopping by from DIY Dreamer. Awesome. I love the simpleness and frugalness of this mask. I may try to do it for my little one!